Jerane DiCostanzo, has lived at 300 Riverside Drive since 1960, which gives her the distinction of having lived there longer than any other current resident. Originally from Massachusetts, she and her husband John moved here from the East Side and raised their two children right here in our neighborhood. John was a founding member of the Block Association, which was originally organized as a crime prevention measure. 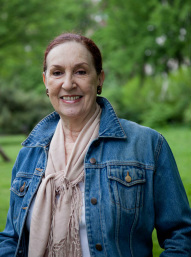 Jerane has enjoyed a long career in the arts, specializing in the field of historical Spanish dance. Formerly a professional dancer with Broadway shows to her credit, she now teaches dance at Flamenco Vivo Carlota Santana in midtown, plays the castanets for the Festival Chamber Orchestra, and serves as a consultant on historical Spanish dance. She describes Broadway as the starting point for all changes in the neighborhood. The biggest differences, she concluded, are the reduction of rental apartments, the increase in trees, and the change in the variety of the stores along Broadway.